. : Lance McLain ::: Dragon Tattoo :. Lance McLain (b. 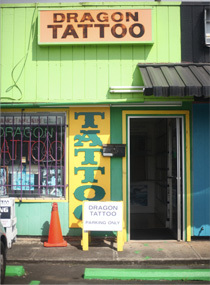 1952), who owns and operates Dragon Tattoo in Wahiawa, is one of the few remaining tattoo artists from the Sailor Jerry lineage who is still working full-time in the “Old School” or classic American style. McLain grew up in Burbank, California, where his mother worked in an office for Universal Studios. His friends’ parents were Hollywood animators, set builders, electricians, and lighting technicians. “I was brought up in front of a TV set,” says McLain. “They didn’t know it was detrimental for kids back then. I was being programmed early with images of movies going through my head, so that is reflected in my work.” After high school, he joined the Navy, ending up stationed in San Diego in 1972, where he met tattoo artists Don Ed Hardy, Mike Malone, and Zeke Owen and decided he had finally found his calling. Hardy and Owens showed him Sailor Jerry’s flash, and McLain promised himself he would one day meet him. In 1973, when his ship was temporarily docked in Honolulu, McLain took a bus to Chinatown and spent three days talking with Sailor Jerry about tattooing. Less than a year later, after Sailor Jerry died, his widow sold China Sea Tattoo to Mike Malone, who hired McLain to be his apprentice. Malone showed him the fundamentals, as well as the finer points of tattooing, and shared Sailor Jerry’s trade secrets with him. McLain worked for Malone from 1976 to 1980, until Malone sold him his Waikiki shop, Floating World. Lance and I have been close friends and associates since 1972, when he came into my San Diego shop as a young sailor. Before long, he was also hanging out with Zeke Owen and Mike Malone, and began tattooing on board ship during his tour of duty in the Pacific. In Honolulu, he got to know Sailor Jerry. After the navy, Lance moved to Honolulu to apprentice with Malone, who had bought Jerry’s historic shop after Jerry’s death. After four years, Lance bought Malone’s Floating World shop in Waikiki—the first-ever tattoo shop in that district. In 1987 he moved to Wahiawa and established Dragon Tattoo, the first shop in that military-based town. Lance upholds the classic tattoo tradition with his fluid and distinctive style, great sense of humor, and story-telling skills. He’s never pursued or gotten much publicity, but deserves to be better known—especially by those who appreciate the 20th century soul roots of modern tattooing. Check him out. The Honolulu Museum of Art breaks new ground with an exhibition that focuses on Hawai‘i’ as the epicenter of tattoo art and culture. Home to the centuries-old Hawaiian kakau tradition, prototypical American tattoo artist Norman “Sailor Jerry” Collins, and the many tattoo traditions found in Japan and throughout Polynesia, Honolulu was destined to develop a corps of sought-after tattoo artists creating a visual language derived from these cultures. The exhibition highlights ten contemporary tattoo artists and explores the rich and diverse cultural traditions found in Hawai‘i today—Hawaiian, American, Japanese and Polynesian cultures will be featured. The exhibition will also trace Sailor Jerry’s lineage, beginning with his predecessors Ben Corday, Owen Jensen, and Brooklyn Joe Lieber, and continuing with his apprentices and inheritors of his craft: Lance McClain, Don Ed Hardy, Michael Malone, and Kandi Everett. Artistically, there is absolutely no one in this business who stands apart like Lance McLain. His style is more than distinctive--- it is original, and he’s never strayed from his original path. I cannot look through a blog or a tattoo magazine and identify by style much original work. With McLain I can. It's always a pleasure to look through his drawings and finished flash to see his take on tattoos and art. He is indeed an original (did I mention original? ).